The original version appeared in Tales of Suspense #82 (Oct. 1966), and was created by Stan Lee, Jack Kirby and Gene Colan. The second version appeared in Web of Spider-Man #4 (April 1993), and was created by Tom DeFalco and Terry Kavanagh. Batch 13 first appeared in Fantastic Force #4 (February 1995), and was created by Tom Brevoort and Pino Rinaldi. Ultra-Adaptoid first appeared in Super-Villain Team-Up: MODOK's Eleven #1 (September 2008), and was created by Fred Van Lente and Francis Portela. The Super-Adaptoid (background) battling the Avengers on the cover of Avengers #45 (October 1967). Art by John Buscema and Vincent Colletta. The original model (simply known as the Adaptoid) debuted in the Tales of Suspense title, being created by scientific organization A.I.M. An android containing a shard of the Cosmic Cube artifact, the Adaptoid is programmed to defeat the hero Captain America, infiltrating the Avengers' Headquarters while impersonating various characters (such as Edwin Jarvis and Bucky Barnes), and then copies the standout fighting abilities and respective traits of several Avengers (Goliath, Hawkeye and Wasp) as the "Super-Adaptoid". After a long battle, the android flees after incorrectly believing that Captain America had been killed. The Super-Adaptoid then took refuge underground near the Xavier Institute For Higher Learning and was unintentionally awakened by an optic blast from Scott Summers. The Adaptoid left his hideout and saw the X-Men in their civilian clothes ice skating. He then recalls that he had another mission: to transform others into Adaptoids like himself, so he begins his attempt with the X-Men. They refused and a fight broke out. As the battle dragged on, Mimic (having just been asked to leave the X-Men) watched from a distance and saw how powerful the Adaptoid was. The Adaptoid soon defeated the X-Men, and was then approached by Mimic offered to become an Adaptoid. During the process, Mimic had a change of heart when learning of having no free will and the two began to fight. During the battle, the Adaptoid tried to copy the powers that Mimic had copied from the X-Men and failed. Mimic then devised a plan and tried to mimic the Adaptoid's abilities, causing huge feedback which made both of them lose their powers. As Mimic was rescued by his fellow X-Men, the Adaptoid fell to a river below. The Super-Adaptoid later attacks Captain America during a charity event involving the Avengers, after copying the abilities/powers of Thor, Iron Man and Hercules. He is tricked into using all his powers at once, overloading himself. The Adaptoid was featured in the Iron Man title reactivated by Jarr and Tyrr as a servant. After a battle where Iron Man defeated the Adaptoid, the android evolved into the metal-based Cyborg-Sinister, attacking Stark Industries which resulted in another confrontation with Iron Man which ended with the android being seemingly destroyed. The Adaptoid reforms in the Captain Marvel title, and after a brief battle with Iron Man follows the hero to Avengers Mansion, where the character battles the team and Kree ally Captain Marvel. Mar-Vell tricks the Adaptoid into copying nega-bands, which act as a portal to the alternate Negative Zone dimension. By striking the Adaptoid's nega-bands together, Mar-Vell banishes the character to the Negative Zone indefinitely. The Super-Adaptoid is retrieved in the Marvel Two-in-One title, and used unsuccessfully by villains Annihilus and Blastaar against the Thing and the Avengers in the Negative Zone. The Adaptoid reappears in the Avengers title. Revealed to be stored at Avengers Mansion, the android is found by the Fixer when a group of supervillains storm Avengers Mansion, overpowering and changing places with Fixer. The Adaptoid disguises himself as Fixer while the real Fixer was in the android's former confinement tube at Avengers Island. The Adaptoid then replicates Mentallo's powers. Uniting a team of artificial beings (Awesome Android, Machine Man, Sentry-459 and TESS-One), the Adaptoid directs them against the Avengers. While the heroes are distracted, the Adaptoid summons the entity Kubik to Earth, so that the character can copy the sentient's powers and become the all-powerful Supreme Adaptoid that can now reproduce itself. Although successful, the android is ultimately tricked into shutting down by Captain America and its Cosmic Cube shard is removed by Kubik. The Super-Adaptoid makes a brief appearance during the Acts of Vengeance storyline having a confrontation with the Fantastic Four (Mister Fantastic, Invisible Woman, the Human Torch and the Thing), and in the Heroes for Hire title where the android has an encounter with the Thunderbolts (aka the disguised Masters of Evil consisting of Helmut Zemo, Mach-I, Atlas, Karla Sofen, Techno and Songbird) and the Heroes for Hire, and the Hulk title where scientist Bruce Banner is blackmailed into being involved with the Adaptoid's repair and activation. The android poses as "Alessandro Brannex" during various titles. With MODAM as an enforcer, Alessandro was the C.E.O. of the terrorist organization A.I.M. on the Boca Caliente island country. While making A.I.M. into a public friendly company, Brannex tries to personally show Captain America of this legal change, and tries to get rid of Iron Man to finish a potential nuclear weapons deal. His impersonation is revealed during Superia's assassination to which the Adaptoid regenerated itself. On the Adaptoid-inhabited Boca Caliente, Alessandro's A.I.M. fraction is behind MODOK's resurrection. The Adaptoid personally reveals itself during a confrontation with the Red Skull but is caught in the recreated Cosmic Cube's reality-warping ability and is presumed destroyed. The Super-Adaptoid appears in the limited series Annihilation Conquest: Quasar, and is revealed to be a warrior in the employ of the Phalanx alien race under Ultron's control. Claiming he left Earth after becoming disgusted with humanity's chaotic nature, the Adaptoid attempts to destroy Phyla-Vell, Moondragon and Adam Warlock. Another model was provided as a field agent of a villainous group against Spider-Man. This Adaptoid is ultimately used by crime boss Blood Rose intentionally to affect the other mechanical teammates. Batch 13 was an Adaptoid in A.I.M. 's possession. Breaking out of its containment unit and escaping to New York City, it copied the various powers/abilities of Captain America and the Fantastic Force. As it was imitating powers, Batch 13 began to have a psychic breakdown after copying Psi-Lord's psycho armor. As a result, Huntara conjured up a portal to send Batch 13 into. Several Adaptoids can be seen on Boca Caliente, fooling several Avengers (Black Widow and Hercules). During the Cosmic Cube recreation, an Adaptoid (having been impressed by Captain America's heroic nature) ended the threat by willingly transforming itself into a non-sentient containment chamber for the reality-warping energies. An Ultra-Adaptoid appears in the limited series Super-Villain Team-Up: Modok's 11. Created by A.I.M. to infiltrate MODOK's group of supervillains, the character has no independent will and is remotely controlled. Courtesy of a satellite relay, the Adaptoid has access to dozens of powers, but is eventually destroyed when released from A.I.M. control. Adaptoids from an alternate reality are used by the Scientist Supreme to combat the Avengers. The terrorist organization HYDRA have Yelena Belova as a Super-Adaptoid to battle the New Avengers. A fusion of human and machine, she managed to copy the New Avengers' various powers. She is eventually defeated when the powers "copied" from the Sentry cause her the same psychological problems. HYDRA then destroys her via a remote-controlled self-destruct device. Norman Osborn is given the Super-Adaptoid abilities by his followers to replace his lack of the Iron Patriot armor and his disinclination to return to his old Green Goblin role, absorbing the powers of the Avengers, the New Avengers, and his personal group. He's defeated when the Avengers and the New Avengers struck him all at once, the multiple powers working against each other and causing him to collapse into a coma. The original iteration is an artificial construct created by A.I.M. capable of copying or mimicking the powers and skills of numerous super beings, including specific equipment (e.g. Captain America's shield, Iron Man's armor, Hawkeye's bow and arrows, Thor's Mjolnir) and clothing. This ability to adapt was originally courtesy of a shard of the Cosmic Cube artifact, although the shard was eventually removed by cosmic entity Kubik. The character, however, has proven capable of continuing to function without the shard. The Super-Adaptoid possesses exceptional artificial intelligence, but limited imagination and an inability to understand the human condition has led to defeat in the past. The Super-Adaptoid's abilities had duplicated/mimicked Alessandro Brannex, Abner Jenkins, Agent Axis, Ant-Man, Beast, Black Knight, Bucky Barnes, Captain America, Cassie Lang, Doctor Druid, Edwin Jarvis, Erik Josten, Fang, Hank Pym, Hawkeye, Hercules, Helmut Zemo, Human Torch, Invisible Woman, Iron Man, Iron Fist, Karla Sofen, Kubik, Luke Cage, Machine Man, Mentallo, Mar-Vell, Mister Fantastic, Monica Rambeau, Paul Norbert Ebersol, Phyla-Vell, Quicksilver, Red Skull's battle suit, Scarlet Witch, Songbird, Thing, Thor, Vision and Wasp. The Cyborg-Sinister is equipped with an axe esque scythe. The Supreme Adaptoid has the power to mass-produce billions of itself in order to replicate/replace human beings. The other versions demonstrate similar mimicking/duplicating abilities of Blitz, Bucky Barnes, Chameleon, Controller, Devlor, Dragon Man, Dreadnought, Eel, Fixer, Franklin Richards, Free Spirit, Huntara, Jack Flag, Madame Menace, Mentallo, Mister Fear, Plantman, Red Guardian, Richard Fisk, Spider-Man, Thermite, Tangle, Vanisher and Vibraxas. Yelena Belova's Super-Adaptoid powers manages to copy the abilities of Carol Danvers, Iron Man, Luke Cage, Sentry, Spider-Man, Wolverine and Veranke. Spider-Man had the idea to overload her ability to duplicate powers by having everyone attack all at once, overloading Yelena's Adaptoid copying ability as she only had the 'space' to copy one at a time rather than all of them. Norman Osborn's Super-Adaptoid abilities copy the powers of Ai Apaec, Gorgon, June Covington, Luke Cage, Protector, Red Hulk, Skaar, Superia, Trickshot and Vision. A similar solution is used to defeat him when all of the Avengers and the New Avengers, overloading Osborn's system and causing him to become comatose as his body couldn't cope with so many different powers. The Super-Adaptoid has been inert dating back to the Age of Heroes and is the subject of worship by a cargo cult uncovered by the Spider-Man of 2099. Upon sighting Spider-Man, the machine (not recognizing this new hero) turns into the closest approximation (a combination of the original Spider-Man and Venom) that it can based on appearance, turning into Flipside. 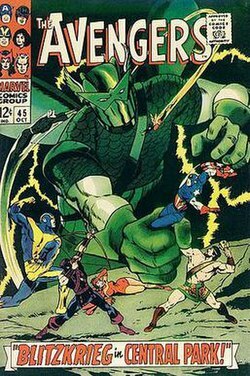 The Super-Adaptoid appeared in Franklin Richards's Heroes Reborn universe as a device used by Loki but is defeated by the Avengers. Since its defeat, it gains sentience as Amazo-Maxi-Woman, joining the heroes' quest to stop Deadpool. In Spider-Gwen which takes place on Earth-65, Super-Adaptoid is known as Project Green and is a member of the S.I.L.K. organization. The Adaptoid appeared in the Captain America segment of The Marvel Super Heroes, voiced by Vern Chapman (Super-Adaptoid and Edwin Jarvis) and by Carl Banas (Bucky Barnes). The Adaptoid was seen in the episode "The Adaptoid". The Super-Adaptoid had non-voiced cameo appearances in the X-Men animated series. The Adaptoid was briefly seen during Mister Sinister's archive footage of Cyclops (in the episode "Till Death Do Us Part" [Pt. 2]), and as one of Longshot's opponents for Mojo's entertainment (in the episode "Mojovision"). Iceman's flashback (in the episode "Cold Comfort") showed the Adaptoid fight the X-Men, injuring Polaris in the confrontation. The Adaptoid appears in the Avengers Assemble animated series, voiced by Jason Spisak, Charlie Adler, and Jim Meskimen. This version (depicted in its white appearance) is seen as a proxy enemy of the Avengers that's controlled by various supervillains. In seasons one and two, the Super-Adaptoid is depicted as Justin Hammer's invention that subsequently serves as a personal enforcer for MODOK within the Iron Skull's supervillain group to take on various enemies (Aaron Reese, the S.H.I.E.L.D. Tri-Carrier and Doctor Doom) as well as be equipped with cosmic power and later as a proxy for Ultron that attacks Roxxon and leads a nano-tech virus that affects humans. An advanced variation (depicted with its green colors) next appears in subsequent seasons. Three Adaptoids would merge with the unnamed Scientist Supreme as the Supreme Adaptoid (in Avengers: Ultron Revolution), and one is among the Avengers' various enemies seen in Kamala Khan's story (in Avengers: Secret Wars). The Super-Adaptoid was the final boss in The Amazing Spider-Man: Web of Fire for the Sega 32X. The android takes on the forms of several previous bosses, making it something of a boss rush. The Adaptoid makes a non-playable appearance in Marvel: Contest of Champions for the IOS/Android. The Super-Adaptoid appears as a playable character in Lego Marvel Super Heroes 2. ^ Tales of Suspense #82 - 84 (October - December 1966). Marvel Comics. ^ X-Men #29 (February 1967). Marvel Comics. ^ Avengers #45 (October 1967). Marvel Comics. ^ Iron Man #49 - 51 (August - October 1972). Marvel Comics. ^ Captain Marvel #50 (June 1977). Marvel Comics. ^ Marvel Two-In-One #75 (May 1981). Marvel Comics. ^ Avengers #277 (March 1987). Marvel Comics. ^ Avengers #286 - 290 (December 1987 - April 1988). Marvel Comics. ^ Fantastic Four #336 (January 1990). Marvel Comics. ^ Heroes for Hire #7 & 10 (January & April 1998). Marvel Comics. ^ Hulk #469 (October 1998). Marvel Comics. ^ Quasar #9 (April 1990). Marvel Comics. ^ Captain America #387 (July 1991). Marvel Comics. ^ Iron Man #296 - 297 (September - October 1993). Marvel Comics. ^ Captain America #412 - 413 (February - March 1993). Marvel Comics. ^ a b Captain America #440 - 441 (June - July 1995). Marvel Comics. ^ a b Avengers #387 - 388 (June - July 1995). Marvel Comics. ^ Annihilation Conquest: Quasar #1 - 4 (July - October 2007). Marvel Comics. ^ Web of Spider-Man #99 - 100 (April – May 1993). Marvel Comics. ^ Fantastic Force #4 (February 1995). Marvel Comics. ^ Super-Villain Team-Up: MODOK's Eleven #1 - 4 (September - December 2008). Marvel Comics. ^ Avengers Vol. 5 #25 - 28 (January - April 2014). Marvel Comics. ^ a b New Avengers Annual #1 (June 2006). Marvel Comics. ^ Avengers Vol. 4 #24 (May 2012). Marvel Comics. ^ Avengers #290 (April 1988). Marvel Comics. ^ Avengers vol. 4 #23 (April 2012). Marvel Comics. ^ Spider-Man 2099 #29 - 30 (March - April 1995). Marvel Comics. ^ Avengers Vol. 2 #11 (September 1997). Marvel Comics. ^ Spider-Gwen Vol. 2 #7 (June 2016). Marvel Comics. ^ "Super-Adaptoid". Avengers Assemble. Season 1. Episode 6. July 28, 2013. Disney XD. ^ "Molecule Kid". Avengers Assemble. Season 1. Episode 8. August 11, 2013. Disney XD. ^ "Avengers Disassembled". Avengers Assemble. Season 2. Episode 15. April 19, 2015. Disney XD. This page was last edited on 31 March 2019, at 07:18 (UTC).